When we heard that the core four members of the Grateful Dead were going to get together one last time for a handful of shows featuring Trey from Phish on guitar, we just knew we had to make it there. Although we were a bit too young for the Grateful Dead – we were both 9 years old when Jerry passed away – the band has been a huge influence on both of our lives. One need look no further than the name we chose for our website to see how the Dead has had an impact on us. Although we had just gotten back to China after a trip home for the holidays that included getting engaged at Phish NYE, there was no way we were going to miss out on these shows. Thanks to a bit of birthday luck for Rachel, we were able to get a travel package with tickets and a hotel room. 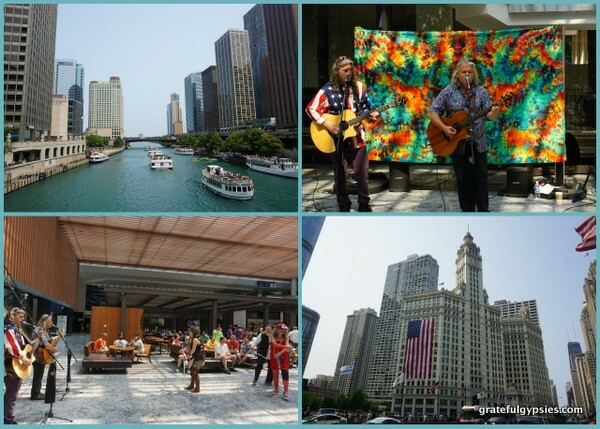 The stars had aligned and we were on our way to Chicago with the rest of the Deadheads to say goodbye one last time. We’re so glad to have made it for these final shows. 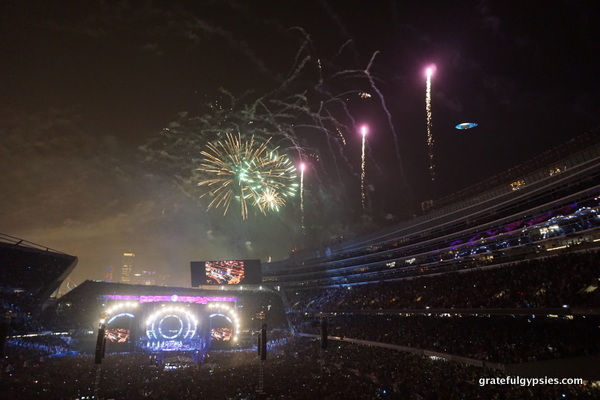 Although the Fare thee Well shows weren’t starting until Friday, there was still plenty of action on Thursday night as the Deadheads started rolling into the Windy City by the thousands. 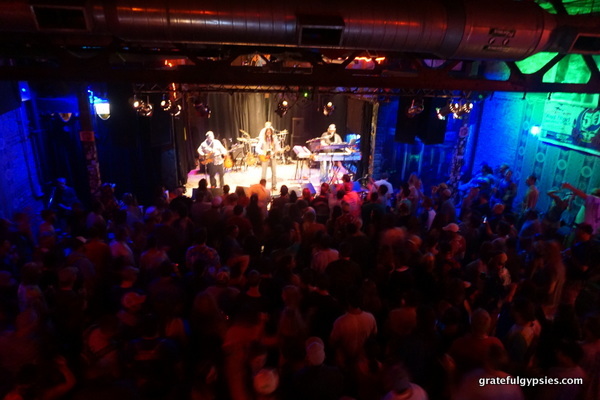 With a wide variety of shows to choose from, we settled on the bluegrass show at the Chicago Theater – Keller Williams’ Grateful Grass featuring the Infamous Stringdusters plus a set from Greensky Bluegrass. 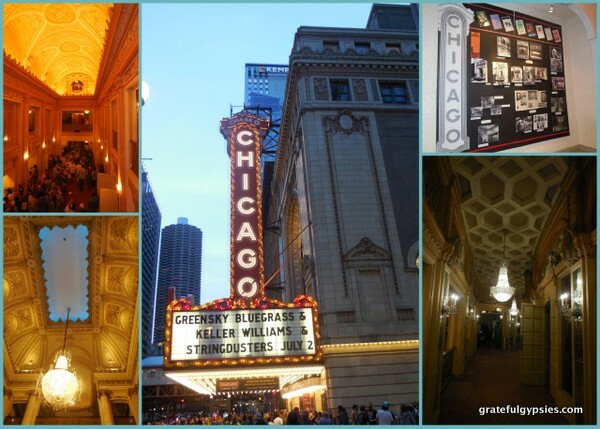 The Chicago Theater is a great, beautiful venue, and we were pretty excited about having box seats for it. With a private entrance, plenty of room to dance, and a waitress eliminating the need to stand in the absurdly long beer line, it was a nice warm-up for the long weekend to come. The music was great as well, with Keller and Co. playing a set full of Dead songs and Greensky treating us to a new Phish cover alongside a set of their original material. Everyone got together at the end for an encore of ‘Black Muddy River,’ ‘That’s What Love Will Make You Do,’ and ‘Franklin’s Tower,’ a fantastic cherry on top of a lovely night of music. In the lot for show #1 of 3. We knew tickets would be really hard to get for these shows so we decided it would be best to buy a Consider it Dan package, as it guaranteed tickets for all three nights and took care of accommodation. We have plenty of friends we could have stayed with in Chicago, but we decided to be fancy since we’re getting married and all. On Friday afternoon we checked in to the InterContinental and the energy was electrifying, even waiting in line for the front desk and the elevators. Everyone was excited to be there and ready to start the party. We took our stuff up to our room and we were pumped to learn we were the only floor with an ice machine in the whole tower. After some drinks in the room, we took the shuttle to the lot, which was a party in and of itself. We would learn the next day how nice it was to have a shuttle included in our package, as it made getting to and from the shows a piece of cake. 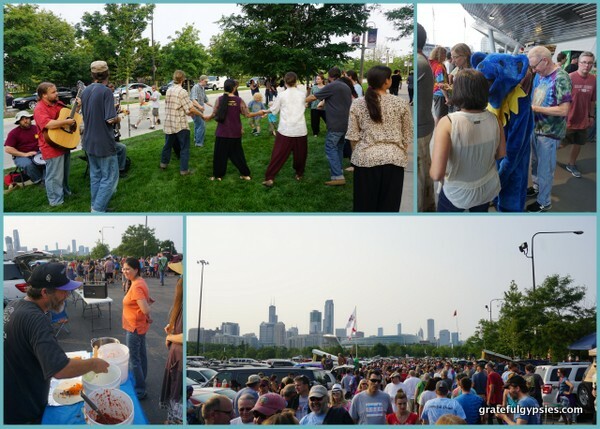 On the first day, we were a little bummed to not see that much vending going on in the parking lot. Wanting an authentic GD experience, we had obviously planned on eating veggie burritos for dinner. After wandering around for a while, we found a super nice guy named Rich who was selling some with all homemade ingredients. He told us about how he had sold the same burritos in the lot from 1989 until sometime in the 90’s. Good times with 70,000 of our closest friends! After a while it was time to head in the show. I wish we had headed in earlier because the line was so long getting in. Finally a kind man opened another door that allowed people to get in more quickly. If it hadn’t been for him I’m not sure we would’ve heard the first song. We didn’t make it to our seats for the opener, but we were in the stadium and could hear it perfectly fine. They opened with ‘Box of Rain’, the same song they closed out their last show with at Soldier Field 20 years ago. 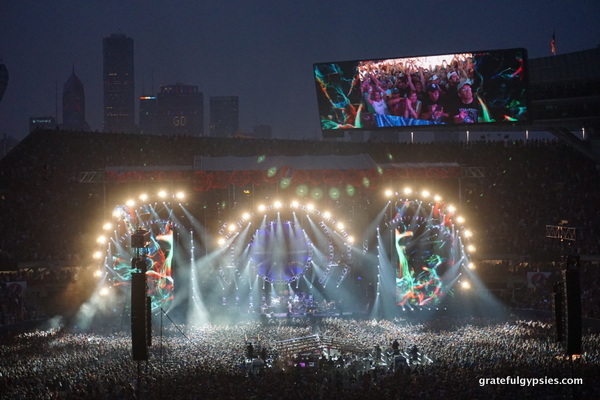 Panorama of Soldier Field on Night 1. Other song highlights included ‘Jack Straw’, ‘Bertha’ with Trey on lead vocals, ‘The Music Never Stopped’, ‘Scarlet-Fire’, ‘Help on the Way’ > ‘Slipknot’ > ‘Franklin’s Tower’, and the encore of ‘Ripple.’ Although we tried to get into a late-night show at the Hard Rock, it was sold out so we just took it easy and saved our energy. Saturday afternoon fun in Chitown. Sasha’s brother and friends managed to find us in the lot so we all went into the show together. Saturday was much smoother sailing getting in than Friday. We all managed to get down on the floor by passing back the same ticket stub from Friday night. We’re not the biggest fans of the floor but the way we all managed to get down there was so exciting we decided to stay. Being able to watch tens of thousands of people getting down in their seats was also fun and added so much to our own energy. Show highlights for us that night were the ‘Shakedown Street’ opener, ‘Standing on the Moon’, ‘Tennessee Jed’ since Rachel is from Tennessee, ‘Friend of the Devil’, ‘Deal’, ‘West LA Fadeaway’, ‘Stella Blue’, ‘One More Saturday Night’ and of course the ‘U.S. Blues’ encore followed by a very American fireworks display. Couldn’t think of a better way to spend the 4th of July. We bought tickets to the ‘Pink Talking Phish are Dead’ after-show and our friends convinced us that we shouldn’t take our free shuttle but walk to the venue with them instead. On the one hand it took forever and we were really tired by the time we got there, but on the other hand it made us that much more grateful for our free shuttle. 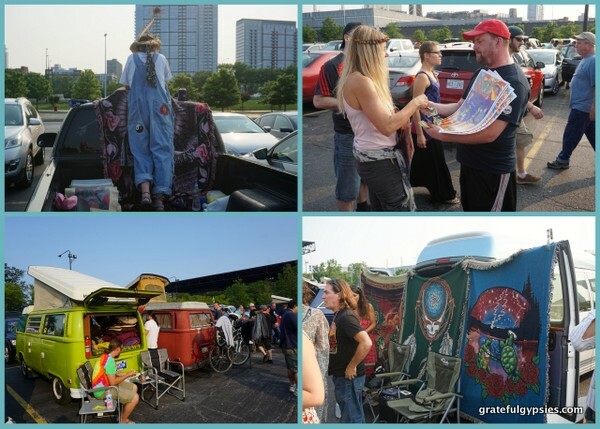 It took an hour just to get to a point where you could get a cab, but it was fun to watch all the silly hippies trying to leave the show with big smiles on their faces. Despite our lack of energy, the late-night was quite good, with the band playing a mixture of Phish, Pink Floyd, Talking Heads, and Dead songs. The third day was much like the second, only it started a bit later thanks to the long night we had just had. We got some lunch with a friend and then headed to the Hyatt to watch the Kind Buds again. After a few drinks in the room we took our shuttle to the lot for the third and final round. 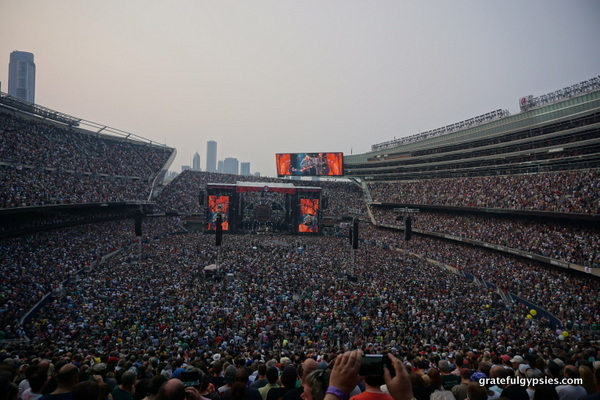 There were a lot more people at the final show – they broke the Soldier Field attendance record every night – so it took a little longer to get in. I was really worried about missing the first song again, but we managed to make it to our seats just in time. The last show was quite emotional for everyone and we cried when they played the last song ‘Attics of my Life’ – a beautiful song with great harmonies which they sang perfectly. I don’t think there was a dry eye in the place. They showed pictures of all the band members on the big screen during the song; Trey’s picture got a huge round of applause from the crowd and rightfully so. 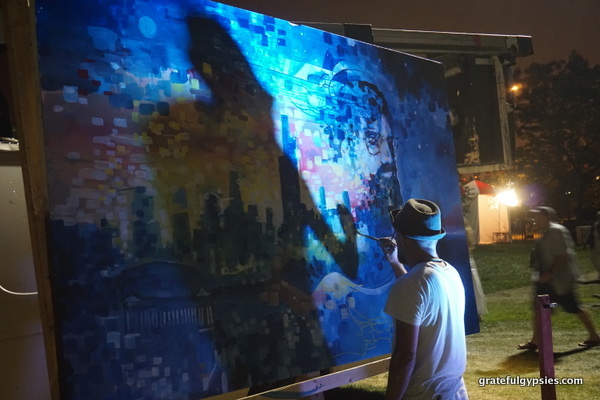 When Jerry’s picture went up, the whole crowd erupted. 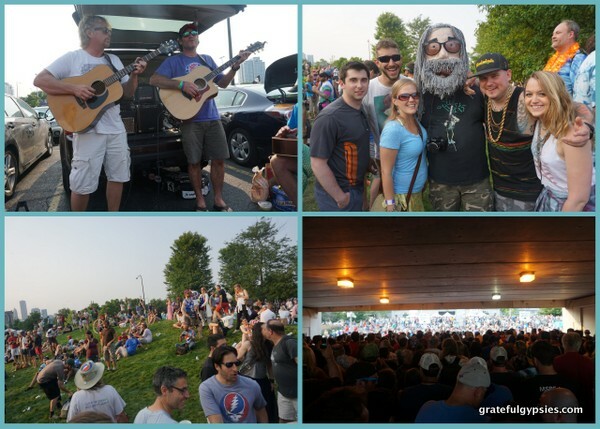 His presence was felt the whole weekend and we’re sure he was smiling down on this gathering of Deadheads. An emotional and incredible final performance. The music was so tight and together that many times I forgot that it was Trey playing lead guitar until they showed him up on the screen. I hope all the hate stops after those incredible shows. Trey was most definitely the right guy for the job and he was phenomenal. Say what you will but he had some big shoes to fill and did so perfectly. Other show highlights from the last night are ‘China Cat Sunflower, I Know you Rider’, ‘Estimated Prophet’, ‘Samson and Delilah’, ‘Truckin’, ‘Cassidy’, ‘Terrapin Station’, ‘Not Fade Away’, and ‘Touch of Grey’. In between ‘Not Fade Away’ and ‘Touch of Grey’ the entire crowd was singing and clapping ‘Not Fade Away’ and it was powerful to feel so much love coming from 71,000+ people all at once. 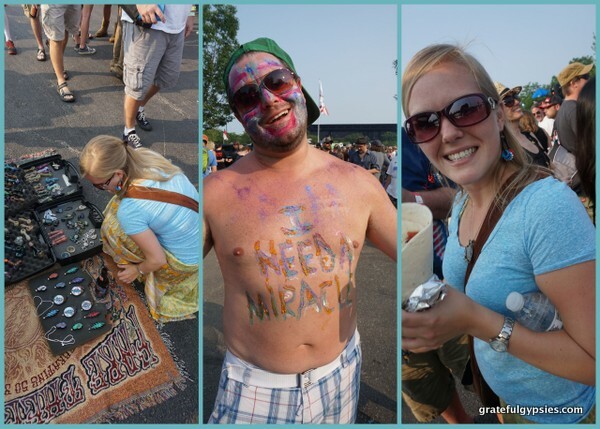 This weekend goes out to the Deadheads – best fans ever! It’s really difficult to put this past weekend into words. It was such an amazing and emotional experience. Several people have asked us what our favorite moments were but there isn’t one moment that stands out more than another. 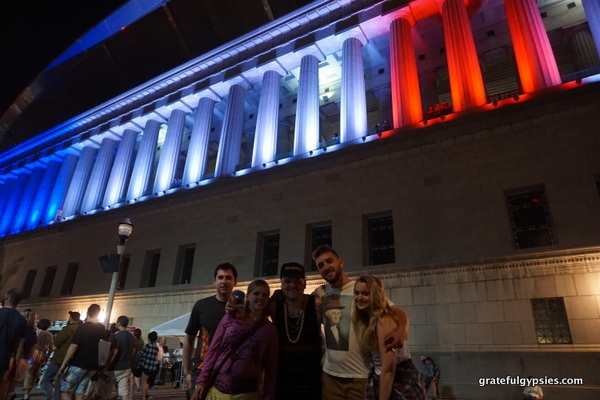 We met some of the friendliest people, saw some of the best music, and we will be forever grateful for the experience. 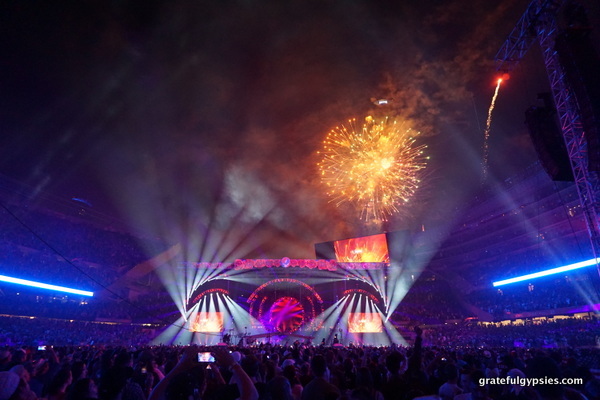 Thank you Grateful Dead for all that you’ve done. Know our love will not fade away!